I'm Cary Kelly, owner and luthier of Mya-Moe. After working extensively during 2018 with Gordon and Char Mayer, the founders and original luthiers of Mya-Moe, I am thrilled to be continuing the tradition of building custom handcrafted ukuleles. My background, aside from paying gigs in the worlds of technology and finance, has been in woodworking as a personal passion. Several years ago, I also became very excited about the ukulele. I was first introduced to Mya-Moe as an owner (#1255 and #1808) and have always adored the tone and playablility of the intruments. The asthetic beauty is a bonus. 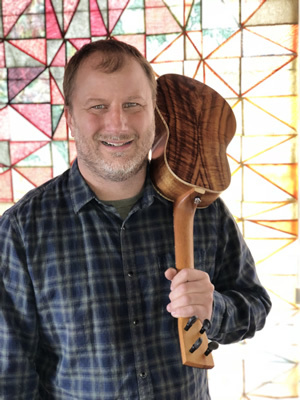 When Gordon and Char announced their retirement and Gordon offered his equipment for sale, I approached him because I was ready to escape the world of finance and felt this was a perfect marriage of my two primary passions, woodworking and ukuleles. Initially, my intention was to build ukuleles under my own brand but after Gordon, Char and I had a chance to work together for awhile it became clear that we shared many of the same attributes, including a high attention to detail and a focus on quality. That's when Gordon and Char approached me about continuing to build Mya-Moe ukuleles. I hesitated at first, because I wanted to be certain that my instruments would match the high standards already established by Mya-Moe. With several instruments now under my belt, I'm happy to offer Mya-Moe ukuleles to future owners. On a personal note...I live in Wilmette, IL with my wife, Mary, and two children, Katie and Bret. Mary enjoys hiking and bike riding and is an avid reader. Katie is a talented painter, dancer and choreographer and Bret excels at baseball, basketball and hockey.